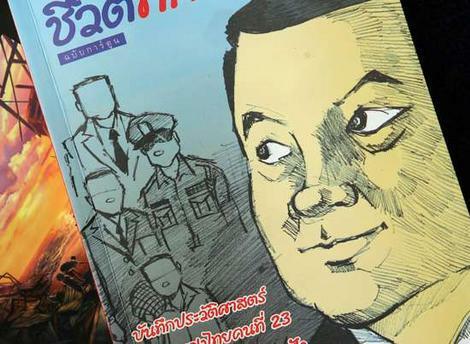 LIKE it or not, a comic book with ousted Thai prime minister Thaksin Shinawatra as a hero for the poor is hitting bookshelves across the country. The 212-page comic, Thaksin’s Life, ends with the clear hope that the former premier will return one day to resume his unfinished mission – to help the poor. About 5000 copies have been printed, but sales have been rather flat. “It has been on sale for days, but its response is not so good,” comic-book author Posatorn Butr-anan said. Posatorn said she wrote the book because of her admiration for Mr Thaksin. She also hoped that pro-Thaksin people would buy her book. A cartoonist helped turned Posatorn’s stories into the comic book. Thaksin’s Life comic book chronicles the life of 57-year-old Mr Thaksin, a tycoon-turned-politician, until his dramatic fall from power in the bloodless coup on September 19. Mr Thaksin is living in self-imposed exile in London. “Thaksin’s mission to help the poor people is not over,” a grandfather tells his grandson in the book. “I believe this hero for the poor will not leave the poor behind. I believe he will come back,” the old man says when the young boy asks if Mr Thaksin would ever come back as prime minister. One of the nine chapters tells how Mr Thaksin, one of Thailand’s richest men, lifted poor farmers out of poverty by injecting money into the rural economy with a government loan scheme. Mr Thaksin was well liked in the north and north-east, thanks to populist policies such as the health scheme that allows every Thai to receive medical treatment for just 30 baht ($A1) a visit. “For the rich people, my populist policies mean very little, but for the poor, they mean a lot,” Mr Thaksin says in the comic book.